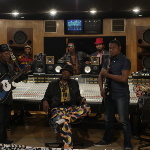 Animated Afro-funk, hip-hopping grooves, high-speed guitar jams: Jupiter Bokondji’s music reflects his many experiences. Born in Kinshasa, he began drumming as a boy, helping his grandmother, a traditional healer, at ceremonies and funerals. In 1974, his diplomat father was posted to East Berlin, where Jupiter discovered rock music. 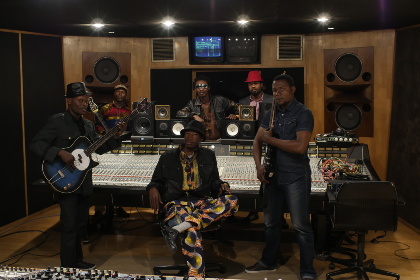 He returned to Kinshasa convinced the music he’d heard in Europe was rooted in the history of the Congo’s 450 ethnic groups and that music could be a unifying force. He travelled the country, developing his style. By 1990, he was touring the continent with Okwess International. In 2007, after civil war chaos, he became the subject of a French documentary, Jupiter’s Dance. The attention took him to Europe, collaborations with Damon Albarn, his breakthrough album Hotel Univers, WOMAD, Glastonbury, Europe and Japan. New album for 2016: Troposphere 13.